(March 2019) I'm offering FREE WORLDWIDE SHIPPING for a limited time! You'll save $8.50!! The gorgeous, jeweled colors in this piece just pop! It is for sure a statement piece, but not huge or heavy. I’ve combine my two favorite styles – rugged mixed metal and sparkly color to create this one-of-a-kind delicate statement necklace just for you! In front - a row of sparkly, multicolor Cubic Zirconia teardrops. From the middle falls a rustic-yet-elegant copper-plated heart. This is all flanked on either side by thin strand of tiny, mixed metal beads. The necklace is 16-1/2 inches (42.5 cm) and has an extender for about another inch. And at the end of the extender? A beautiful pink teardrop and a tiny turquoise Swarovski crystal! This is the only accessory you'll need for all of your special occasions! Why not gift it to your sister for her birthday? ≜ Love this item but want to buy later? © dori jenn 2019. All images and designs are the intellectual property of dori jenn. All rights reserved. This is the most beautiful necklace ever!! The colors are brilliant!! Great customer service. Fast delivery. Gorgeous boho-style ladder necklace! Thank you! Item is very over priced. On the web page it gave a discounted price but I was charged full price. Will not shop at this shop again. Une merveilleuse pièce ! 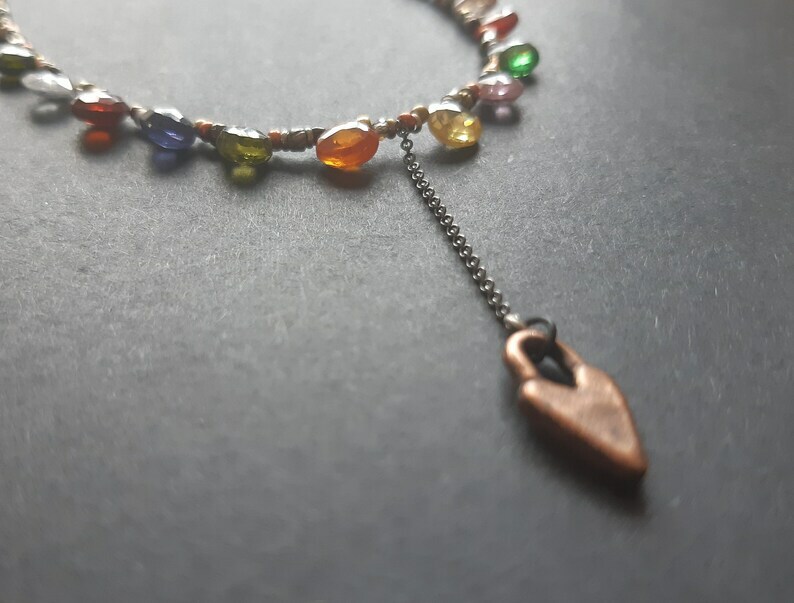 Ce bracelet est superbe, c'est un travail de grande qualité. Il fait beaucoup d'effet lorsqu'il est porté. Merci pour vos créations toujours aussi belles ! I accept payments through Paypal. But if you do not have a Paypal account, don't worry! Please read the following simple steps for an easy way to pay with your credit card on Paypal. At Etsy checkout choose to pay with Paypal. Once you are redirected to Paypal. . . . .
1) Instead of choosing to pay with a PayPal account, select the option to pay with a debit or credit card. 3) You'll also be asked whether you want to save your information with PayPal. UNCHECK the box if you don't want to. You will still need to enter your e-mail address so PayPal can send you a receipt. 4) Click Continue to return to "Etsy Checkout" to review and submit your final order. Your payment isn't sent until you click SUBMIT ORDER on Etsy. If your payment arrives in the form of an e-check through Paypal, items will ship once it clears (3-5 days usually). For custom orders, I will begin to work on your piece(s) as soon as you checkout and payment is received. *My shop prices include all payments necessary for the item to reach your doorstep. However, I cannot control or be responsible for additional tax or fees in your country. >>---------->>>>> I hope you will be happy with your purchase! But if for whatever reason you are not satisfied. . .
✔ Please notify me within 5 days of receipt and I will fully refund your cost of the item but not the shipping fees. ✔ If a product has been broken or damaged during the delivery to you, please send me a private message and include pictures of your damaged item. I will respond quickly. ✔ Please send your returned item(s) via registered airmail. Postage for returns is paid by customer please. Please consider purchasing insurance for the return package as dorijenn does not take any responsibility for reimbursement or compensation in the event that any return packages are lost, stolen, or mishandled. ✔ I will refund the $ to your Paypal account when I receive the merchandise back in its original condition. ✔ I will process the refund within 5 business days upon receiving the package. ✔ Shipping costs include: postage, wrapping as gift, packaging & handling. ✔ All items will be wrapped like a pretty gift, packed very well, and shipped from Israel by registered airmail within a week to ten days of payment. ✔ I will always use the address from your Etsy transaction page - not the Paypal address (unless otherwise requested). ✔ Special/custom orders can take 10-15 days to prepare. ✔ Please expect up to 2-3 weeks delivery time from Israel to the USA, Canada or Australia, and not less than 10 days to Europe. Feel free to contact me with any special requests or upgrades for mailing. ✔My customers are responsible for claiming their packages upon delivery - items may need to be picked up at your local post office - and any duties/fees due upon delivery are the buyer's responsibility. If your item is unclaimed it will be returned to me - in which case your purchase will be canceled and refunded minus shipping as soon as I receive the item back..
✔ My home/studio is smoke-free & pet-free. ✔ dorijenn is not responsible for any unexpected costs incurred with regard to customs to your country. Sometimes packages can be stopped at customs. I can't be responsible for customs fees or taxes; your country is free to make citizens pay fees on imported items, according to the local law. GOOD TO KNOW. . .
✔ All jewelry designs are the sole creation and property of dorijenn and they remain so even if purchased. Please do not copy or re-sell any items without written permission from me. ✔ All dori jenn jewelry is made to withstand day-to-day wear, but not sports or rugged activities and not water. It is always a good idea to store jewelry in a plastic zip-lock bag to prevent tarnish or damage. ✔ My photos of items are taken in macro mode on my digital camera, so the jewelry may appear larger than it is. Please take note of the measurements in the description or inquire about the measurements with me! I would hate for you to be disappointed because you expected the item to be larger or smaller. ✔ Keep your jewelry stored properly. Do not place jewelry pieces with other items. If stored in individual plastic, resealable bags, you can avoid most tarnishing & damage issues. Your jewelry may be damaged by direct contact with water, hairspray or perfume. DO NOT spray perfume or hairspray when wearing jewelry. Use products first, wait a few minutes for it to dry, then put jewelry on. ✔ Thanks so much for your interest in my jewelry!! COPYRIGHT © dorijenn 2008-2016 All images and designs are the intellectual property of dorijenn. All rights reserved. Neither this jewelry or any of it's parts may be reproduced, distributed, sold or altered in any way without permission from dorijenn.